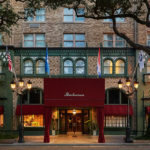 Located in New Orleans’ historic Garden District area along the St. Charles Avenue carnival route, its 200-year-old oak trees draped with Mardi Gras beads, the Pontchartrain Hotel boasts the singular convenience of the city’s clanging streetcar line running directly to its doorstep. 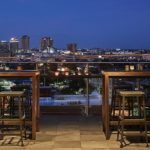 The storied New Orleans hotel, beloved by locals and recently renovated with respect to its timeless aura and original bones, is at the crossroads to downtown and uptown entertaining, restaurants, music, shopping and business conferences. It is minutes from downtown’s boisterous French Quarter scene, the theater and commerce Central Business District row and live jazz hub the Faubourg Marigny as well as uptown’s tony University Area (Tulane and Loyola), the youthful indie vibed shopping and fine dining Magazine Street sprawl alongside the Spanish moss-cloaked Audubon Park and Zoo. Drive, stroll (recommended), bicycle or take the streetcar to randomly hop off at all points in between. From the magnificently decrepit cemeteries to grand architectural gems, oh, the things you will see. Tucked away behind the hotel, you’ll find The Parlor at the Pontchartrain, a sparkling gem hiding behind an unassuming garage door. 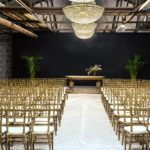 With its historic industrial shell and glamorous details, it is the ideal venue for weddings, celebrations, and grand events of all kinds. 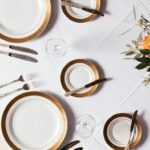 Event catering provided by QED Hospitality. 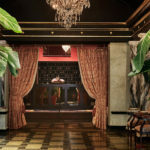 Named for big dreams started with humble beginnings, The Parlor at the Pontchartrain is inspired by a woman with a dream to be an entertainer or at least to entertain. With one last nickel in her pocket, she walked to the riverboat, put the coin in a slot machine, and bells started ringing. The prize wasn’t enough for her to buy an Uptown mansion, but it was enough to buy an old garage, that much like herself, was asking for love. 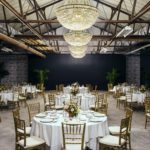 She added some sparkling chandeliers, some found furniture, and opened the doors to all of those who wanted to make memories, share a meal with friends, celebrate love, or dance the night away. A crimson-painted path ushers all who arrive into the space. 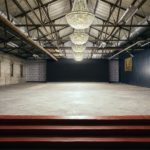 There, they will find a 2,790-foot venue with historic brick walls, stenciled concrete floors, and French toile wallpaper, all illuminated by a spine of crystal chandeliers suspended from the peak of the vaulted ceiling.